The Paris fire brigade knew exactly what they were doing. They knew they could not save the roof, and so they went inside and saved the building. And, voila! It worked. 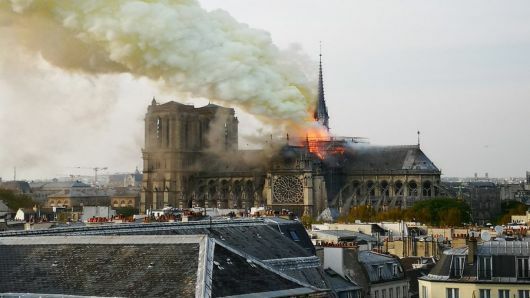 Incredibly, it begins to appear at least from preliminary reports, that all the Cathedral of Notre Dame de Paris is going to need is a lot of love and a new roof. 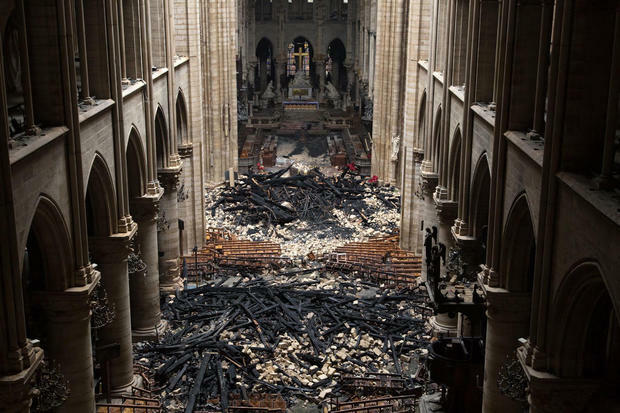 The City Hall of Paris released photos of the interior today which show massive amounts of debris from an 800-year-old wooden-beamed roof that, sadly, is no more. Still, the medieval stone masons' genius saved Notre Dame some 800 years after she’d been built. 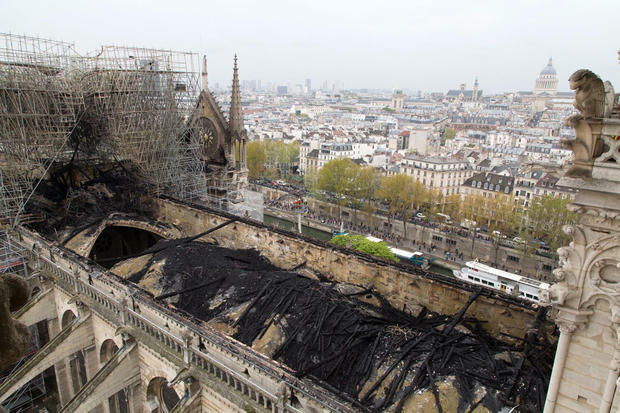 The roaring flames quickly compromised the many-ton wooden structure of the attic, which collapsed onto the vaulted ceiling of the cathedral, threatening to fall through and down into nave below. And then, what of the walls themselves? But the great gothic buttresses and flying buttresses did their job. They held, until the fire on the roof had burned itself out. And if the wind had shifted and fanned the flames into the twin bell towers, the huge bells (such as the 13-ton Emmanuel) would have come crashing down, bringing their fortress-like towers with them. Many are calling this miraculous, and indeed it well could be. But perhaps we should also admit that the Paris fire brigade knew exactly what they were doing after all. They knew they could not save the roof, and so they went inside and saved the building. And voila! The interior was saved, under the watchful eye of the pieta, now covered with ash but otherwise unharmed. 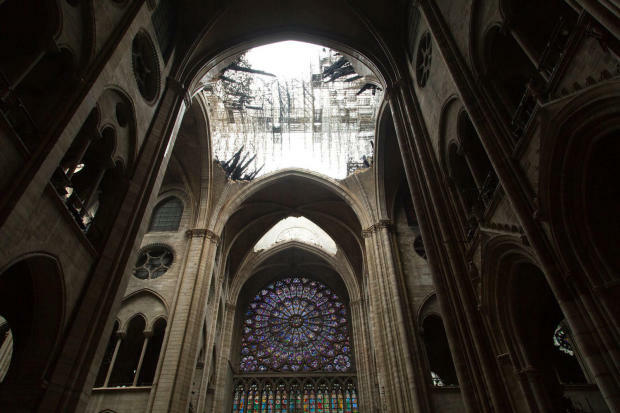 Even though the flames swept over the cathedral so intensely, much of the interior was saved Notre Dame's two medieval bell towers were still intact, and its stained-glass rose windows appeared mostly unscathed. After a lot of speculation, rumors and fake tweets about a government-sponsored "reconstruction project" that would be in conformity with "diversity" and "multi-cultural" secularist standards (whatever that means), one wonders how much architectural leeway would even be possible, given the facts that the walls still stand, the buttresses held, the towers are secure and the interior was saved. Five years and a billion dollars to restore Notre Dame? Sounds fairly reasonable, at this point. But given the horrors we all witnessed just two nights ago, is it really so absurd to suggest miraculous intervention? 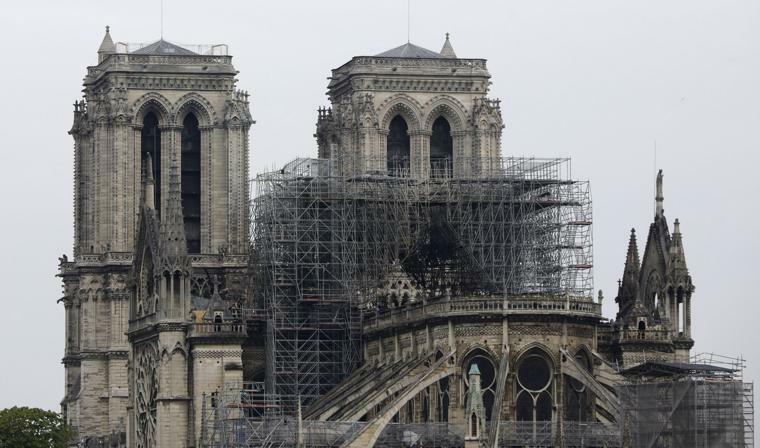 Even the "experts on TV" said the fire could well spread across the Ile de la Cite and that there was really no hope of saving the Cathedral. Fox News' Shephard Smith said Notre Dame would 'burn to the ground." And, indeed, that is exactly how it looked. Even the mayor and a spokesman for the fire department had said they might not be able to save any of it. Notre Dame appeared to be burning to the ground. 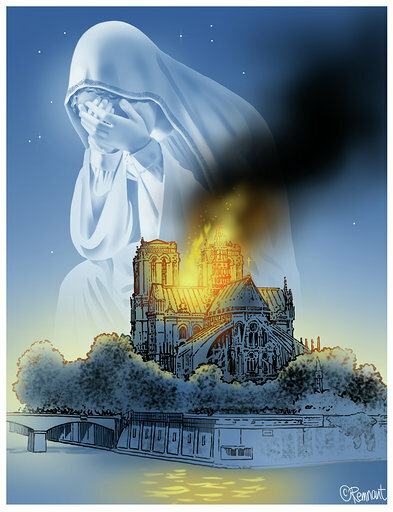 And, yet, here she is--Notre Dame--wounded and weeping for her wayward children, but still standing like the stone metaphor for a mother waiting for her lost little ones to come home. And as long as she stands in silent, if charred, maternal reminder, there is hope for them and for us all. Chez soyez Reine, nous sommes a Vous! This RTV Short uses happier images from Remnant Tours in Paris to pay homage to Our Lady's cathedral, which yesterday was engulfed in flames so completely that many thought she would surely burn to the ground. Evidently, Our Lady had other ideas. After Parisians watched her burn, rosaries in hand last evening, they awoke this morning to find the old Cathedral miraculously still standing, the Crown of Thornes rescued, the famous rose windows, pieta and organ saved. The Godless world had looked on in horror as one of Catholicism's most important symbols went up in smoke and, incredibly, they wept. New from RTV. . . In this Remnant TV Short, we examine the bizarre scene at the Vatican last week when Pope Francis suddenly took it upon himself to start kissing the feet of some visiting dignitaries. 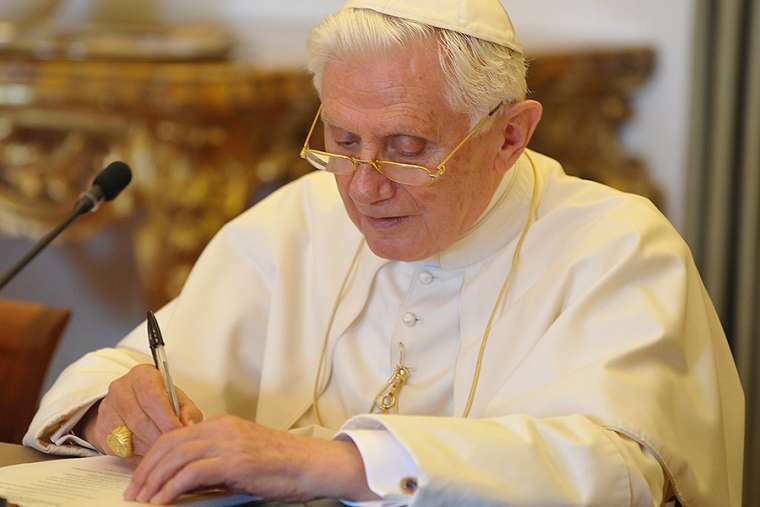 To see the Vicar of Christ, Successor of St. Peter, down on all fours did violence to the sensibilities of many Catholics, while giving others to believe this is the humblest pope in the history of the world! But is it humility that causes one to stand when others kneel, to keel when others stand, and to constantly be seeking out opportunities to single oneself out and to be different? PUBLICATION NOTICE: The April 15th issue of The Remnant Newspaper is in the mail. And everyone's favorite Father Celatus. These bylines and more in the April 15th issue of The Remnant Newspaper--Read them all by subscribing to The Remnant right now! Order the print edition in the next three days and the April 15th issue will be the first Remnant Newspaper of your subscription! LOOKING DOWN THE ROAD: How Will This Crisis End? Morris Dees is the co-founder and former chief litigator of the Southern Poverty Law Center. His employment was terminated on March 13, 2019 after rumors and allegations of sexual misconduct, discrimination and suspicious fundraising had found their way into several mainstream media reports. Cohen stated that Dees’s dismissal over misconduct was effective on Wednesday, March 13, but declined to elaborate further. Gee, wonder why the SPLC finally got rid of Morris Dees. . . Various well-respected news organizations have rightly cited the Dees dismissal as vindication for what so many respected commentators have been saying for so long--the SPLC has a massive credibility problem that should preclude any legitimate news agency from taking their "findings" seriously. "More than two decades ago, I was managing editor of the Montgomery Advertiser, which was located one block from the SPLC in downtown Montgomery, Ala. I proposed an investigation into the organization after ongoing complaints from former SPLC staffers, who came and went with regularity but always seemed to tell the same story. Only the names and faces changed. The SPLC, they said, was not what it appeared to be. Many urged the newspaper to take a look. "We were, at the time, anything but adversaries with the center. Like other media outlets, we generally parroted SPLC press releases. We also became friends with SPLC staffers, occasionally attending the center’s parties. Some of my reporters dated staffers at the center. "That relationship, however, suddenly soured when reporters Dan Morse and Greg Jaffe (both of whom now work for The Post) began making serious inquiries about the SPLC’s finances and the treatment of black employees." Stephen Bright, a Yale law professor and former director of the Southern Center for Human Rights in Atlanta, told the Times that SPLC’s fundraising is “fraudulent,” and called Dees a “flimflam man and he’s managed to flimflam his way along for many years raising money by telling people about the Ku Klux Klan and hate groups,” he said. “He sort of goes to whatever will sell and has, of course, brought in millions and millions and millions of dollars. For the record, The Remnant has been targeted by the SPLC as a 'hate group' for over ten years. And over the course of that time, if there's one thing we've learned it's that the SPLC is not invincible. They traffic in intimidation and fear, and if they can't achieve that desired effect, they've got nothing! We have fought back every time a local mainstream media outlet, using the SPLC material, has come after The Remnant. And I would argue that we've not lost a round yet. “Southern Poverty Law Center has been criticized in the past for having too broad a definition of hate.” (WCCO TV reporter, Heather Brown, August 14, 2017) So there’s your 2017 Understatement of the Year. But then why did WCCO TV rely on an obvious Fake News source to concoct a nothingburger story like this? Let us consider this textbook example of Fake News. Last night, WCCO TV attempted to forge a link between white supremacists in Charlottesville, VA and—wait for it! —The Remnant. As the primary source for this “exposé”, WCCO reporter Heather Brown trotted out the 2006 Southern Poverty Law Center Intelligence Report on hate groups in America. Regurgitated for the umpteenth time were the old SPLC scare claims that a number of ‘hate groups’ (including The Remnant) are active here in Minnesota, and thus by implication form some sort of threat to the common good along the lines of the violent protesters in Charlottesville. I have no desire to defend the lunacy of whatever actual hate groups may exist in my home state, but the existence of a least some of these alleged groups seems suspect at best. According to investigative reports published by conscientious local reporters over the past few years, local police chiefs in Minnesota counties where the SPLC’s hate groups are alleged to reside have, in fact, never even heard of said hate groups. So either they don’t exist at all, or they’re comprised of one or two obscure nutters that present no actual threat, which is why they’ve never registered so much as a blip on law enforcement radar. If there’s a notorious band of racists in St. Paul, however, their presence has gone unnoticed. Police Sgt. Paul Paulos has called the city home for the last half-century. It’s been three decades since he last saw a skinhead. "We had skinheads in South St. Paul, but that was back in the '60s and '70s," he says. "Our database shows nothing about these guys, and it dates back to 2001. I can honestly say I haven't heard about them and there's no reason for me to tell you otherwise." Adds Sgt. John Eastham of the Ramsey County Sheriff's Department: "I personally have never heard of that group." Despite local police skepticism, the SPLC is sticking to its claim. As best as anyone can tell, Dean's once-mighty movement now consists of a middle-aged man with a calf tattoo, a keyboard, and an internet radio show. Consider him emblematic of Minnesota's struggling state of organized hate. In any case, even the expert from St. Thomas had to admit during the course of the WCCO broadcast that: “You have to be somewhat cautious at using their [SPLC] labels…even though they’re still a good source”. Really? A good source of what—Fake News? And why would a reputable news agency give a second thought to a source that tends to get its labels wrong? Correctly labeling the subjects of your investigation is sort of Journalism 101 stuff, isn’t it? To her credit, Ms. Brown admits that the “Southern Poverty Law Center has been criticized in the past for having too broad a definition of hate.” True enough, but evidently Ms. Brown’s journalistic curiosity was not sufficiently piqued to look into the grounds of that criticism. The SPLC tactics were cited as prompting at least one fan-turned-violent-vigilante to go on a shooting spree a few years ago. Back in 2012, Floyd Lee Corkins II, a self-appointed executor of the SPLC’s implicit will, entered the lobby of the Family Research Council in Washington, D.C., and started spraying bullets all over the place. Building manager Leo Johnson stopped him but only after taking a bullet in the process. We sent this link to WCCO TV, but it didn’t deter them from doing a story based solely on the authority of the same out-of-state and out-of-control SPLC. So when some nut comes to my office and starts spraying lead, exactly why will WCCO TV not be responsible for their fire-in-the-theatre “journalism”? Briefly, let’s look at how it works: They dig up scary-sounding names of little-known racist clubs or lone nuts on the Internet. Then they associate those groups with reputable conservative organizations they don’t like. Then they designate all of the above as ‘hate groups’. Finally, they employ various scare tactics to raise money to “stop the hate” coming from such “dangerous” groups as Focus on the Family, Glenn Beck, Ron Paul, Judge Andrew Napolitano, the American Family Association, Tony Perkins, the John Birch Society, World Net Daily, The Remnant. You name the conservative pro-family group and the SPLC has got them targeted and most often listed on its trusty “hate map” right alongside lunatical neo-Nazis and octogenarian Klansmen. Last year the SPLC went so far off the rails as to include presidential candidate Dr. Ben Carson on their hate watch list. While Dr. Carson had enough power and influence to finally get his name removed, the damage was already done. This is textbook Fake News. Throw as much mud as you possibly can at a given person or organization, wait to see if any of it sticks, and then hope nothing untoward happens to force a retraction. The SPLC Hate Map is a joke, of course. But in a society like ours, where racial tension is at an all-time high, such jokes present a threat to innocent people that’s no laughing matter. And what does all of this have to do with Traditional Catholics? Just for good measure, the SPLC’s hate map includes a category called ‘radical traditionalist Catholics’. So back in 2007, Father Nicholas Gruner, the Fatima Center, the SSPX, CFN, The Remnant, and many other traditional Catholic groups found themselves targeted on the SPLC Hate Map. There was no due process, of course. No trial. No hearing. In the fascist world of the SPLC, everyone with whom they disagree is simply guilty until proven innocent. And the folks at the SPLC don’t seem to care too much about truth. Back in 2007 they flat out refused our lawyers’ requests to meet with them in person, to explain who and what The Remnant is. Demagoguery and polarization are the name of their game—not dialogue and peace making. The Remnant was just another victim of the SPLC’s high-powered bullying/fundraising scheme, with their lawyers always careful to avoid any accusations against us of actual violence, as this would guarantee a SPLC defeat in a court of law. It all comes down to a radical and willy-nilly definition of ‘hate’. If you think marriage is between one man and one woman, for example, you’re a dangerous homophobe. If you accept the Catholic dogma that all men will be saved only through Jesus Christ, well you’re anti-Semitic and guilty of ‘religious supremacism’. If you’re concerned about ISIS and terrorism, you’re guilty of Islamophobia. That sort of thing. Hyperbolic hate baiting at its worst, with no basis in reality, no room for debate, and no serious attempt to prevent the violence against innocent people that can and often does result from witch-hunt tactics. Thanks for your inquiry. I’m not sure what more I can say, over and above what I’ve said many times to other reporters since the SPLC put The Remnant on their hate map back in 2006: The Remnant is not a hate group. The Remnant is not a “group” at all, in fact. It’s a Roman Catholic newspaper that’s been going to press every two weeks in this Archdiocese for 50 years. My grandfather, Joseph Matt, KSG (made a papal knight by Pope Pius XI) was on the planning committee for the city of St. Paul, and was later honored as America’s Editor Emeritus after he retired, having had another one of our family newspapers, The Wanderer, specifically banned by the National Socialists in Adolf Hitler’s Germany for his weekly opposition to the Nazi scourge. The founder of The Remnant, Walter Matt, is a decorated World War II vet who spent 3 years of his life fighting Nazis in Europe with the 323rd Service Group of the U.S. Air Force. And I’m a happily married 50-year-old who’s raising his kids here in Minnesota, loves life, loves his neighbors, feels blessed to be alive, and doesn’t hate anyone. And yet according the SPLC, I’m the ‘leader of a hate group.” Question: Who hates whom here? The Remnant deplores, denounces and condemns without reservation any and all forms of racism, violence and hatred against anyone for any reason—be it race, gender, ethnicity, religion, skin color, sexual orientation or any other factor seen or unforeseen. We condemn all hatred—past, present and future—on religious, moral and theological grounds. Jesus Christ told His followers to love everyone, to see Christ in everyone, even those with whom they disagree—and this revolutionary idea is at the heart of everything we as Christians try to do here at The Remnant. Hate has no place here. It’s what the old priests used to call a “mortal sin”—a grievous offense against God. By the way, we have no affinity whatsoever with the so-called Alt-Right (in fact, there’s a new Remnant expose of the Alt-Right on our homepage right now). So in your story, if you quote the above paragraph, obviously my credibility as the “leader of a hate group” will be instantly destroyed with the very people I supposedly represent. So, please, don’t hesitate to quote me. Thanks for checking with us before doing your story—something the SPLC never did, by the way. They slapped our newspaper on their hate map without even contacting us beforehand. I’m sorry, Ms. Brown—but few are likely to be convinced by the accused guy’s protestations of innocence. Of course, I’m going to deny the charge that I hate people. But you’re a journalist with a mountain of evidence against the credibility of the source of the false charges leveled against an innocent man. Why did you bury it, when you as a professional reporter had to know very well The Remnant is the farthest thing from a hate group? In 2010, a group of Republican politicians and conservative organizations criticized the SPLC in full-page advertisements in two Washington, D.C., newspapers for what they described as "character assassination" because the SPLC had listed the Family Research Council (FRC) as a hate group. In October 2014, the SPLC added Ben Carson to its extremist watch list, citing his association with groups it considers extreme, and his "linking of gays with pedophiles". Following criticism, the SPLC concluded its profile of Carson did not meet its standards, removed his listing, and apologized to him in February 2015. In October 2016, the SPLC published a list of "anti-Muslim extremists", including British activist Maajid Nawaz and ex-Muslim activist Ayaan Hirsi Ali…Nawaz, who identifies as a "liberal, reform Muslim", denounced the listing as a "smear", saying that the SPLC listing had made him a target of jihadists. Mark Potok of the SPLC responded "Our point is not to make these people targets for violence... The point is to tamp down the really baseless targeting." The Lantos Foundation for Human Rights & Justice has written a public letter to the SPLC to retract the listings. Your point, Mr. Potok, is NOT to make these people targets of violence? No doubt their widows will be comforted to know that. And let’s keep in mind that if this much incriminating evidence survived the SPLC’s WIKI editors (constantly at work, trying to keep their mounds of dirty laundry off Wikipedia), there’s obviously a lot more that didn’t make the cut. So, again, why is WCCO TV so eager to close an eye to a “source” mired in this much controversy? Can they blame anyone for calling ‘Fake News’ on WCCO TV? This is all old news too, of course, but it’s not just about The Remnant. They’ve been at it for years. And this is how the voice of conservatism in America will eventually be silenced, if not criminalized, if somebody somewhere doesn’t stand up and object. So, it’s working— this campaign against conservatism and especially faithful Catholics who accept the teachings of the Catholic Church on marriage and morality and salvation—something the mainstream media now routinely castigate as hateful “religious supremacism”. This isn’t some paranoid fear reserved for others and for the future. The Remnant is being attacked right now by powerful far-Left special interest groups and their lapdog accomplices in the mainstream media. Take a moment to imagine how my wife and seven children felt this morning when phone calls began coming in from friends, neighbors and people at church who’d seen the evening news last night, and learned that their husband and father is the ‘leader of a hate group.’ Imagine this happening to your family, especially right now, in the midst of a dangerous climate of hate, unrest and even violent protests that are claiming the lives of innocent people. I’m sorry, but joke or not, we’re not going to allow the SPLC and MSM to get away with this without a fight. I’ve been in contact with The Remnant’s lawyers all day today, exploring our legal options against this defamation by mainstream media. If they’re going to try to take The Remnant down, I promise you we will not be intimidated. Pray for us, and please help me defend The Remnant and all traditional Catholics against this institutionalized hate and media witch hunt. Please donate to The Remnant’s tax exempt foundation today, and help us stop the real hate groups from completely silencing America's Christian voice. St. Mary Parish, the FSSP apostolate in Providence, Rhode Island, was recently featured in a news segment on WPRI, a local Rhode Island station. The video features interviews with Fr. John Berg, FSSP, pastor of St. Mary’s, and parishioners of the church. A church which, prior to the arrival of the FSSP in late summer of last year, was facing dwindling attendance and a very real danger of closure. One of those interviewed is a parishioner who has been attending St. Mary’s for ten years and saw it go from flourishing to just surviving, and now has witnessed its revival under the administration of the FSSP. He was a little skeptical of the Latin Mass at first, but now seems to have embraced the liturgy that has drawn faithful from all over the region and filled the pews once again. “It will never close now,” he says with a grateful smile. REMNANT COMMNET: In case anyone has somehow failed to notice, the FSSP apostolates are booming all across this country. The story is always the same: Church scheduled to be shuttered, flourishes after traditional fraternity takes over. It's the exact same story with the Church of All Saints here in Minneapolis. The parish was all but dead a few years ago. The FSSP came in and now the place is teeming with young families, two priests, some nuns, a huge home-school co-op and hundreds of faithful refugees, in desperate search for what Holy Mother Church has been offering her children for almost two thousand years. This is fast becoming a traditional Catholic national revival. God is good, and this thing is far from over. As The Remnant’s various expansion projects (which your support of The Remnant has financed) move forward, I’m pleased to announce the completion of one of them: Our new website for the Official U.S. Chapter of the Pilgrimage to Chartres, France, is now live and online. The Paris/Chartres Pilgrimage is a three-day walk from Paris to Chartres, France. Pilgrims are organized into "chapters" of 20-60 pilgrims. This famous pilgrimage--walked by saints (such as Joan of Arc) and kings (such as Louis IX)--is actually the first sixty-five miles of the old French starting point on the great Camino de Santiago de Compostela (in Spain).